Mergify: Features of Microsoft's new Surface Book. A great laptop needs a fantastic display, whether it's for binging on Netflix, checking the news in the morning or just hammering out an email. On paper, the Surface Book looks like it should deliver comfortably in this area. It also has a touchscreen, so you can it can use it in tablet mode, and there's support for the same pen Microsoft announced alongside the Surface Pro 4. Microsoft has used the same PixelSense technology found inside the Surface Pro that it has used on the Surface Pro 4, this lets the display detect whether it's being touched with a fingeror sylus and optimise itself accordingly. During the announcement Microsoft presented a very telling slide describing the performance of the Surface Book – it's 50% faster than the MacBook Pro. 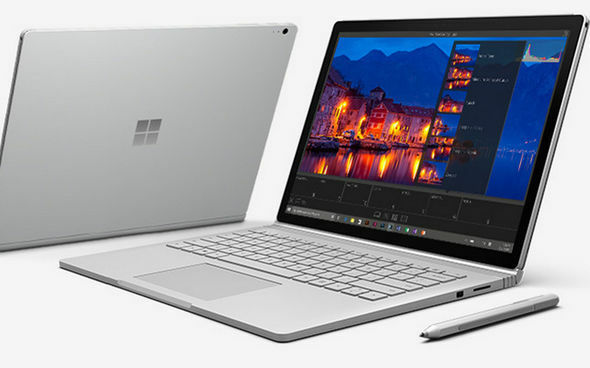 Powering the Surface Book are the latest Skylake Intel Core processors – either the i5 or i7 – paired with an Nvidia GeForce GPU with GDDR5 memory. What's interesting is that the GPU is located in the keyboard, so you'll have to attach it to get the full amount of power. Keyboards and trackpads are often the features of a laptop that tend to disappoint the most, and Microsoft seems to agree. The Redmond company has crafted a laptop keyboard it claims is 'perfect'. For one, it's backlit – for all those nighttime work and gaming sessions and the keys themselves are deeper, with 1.6mm of travel. Another clever feature of the Surface Book is the hinge, which certainly has a distinctive look. This allows you to fold the screen around and hold the device in a tablet mode. This is important, because as we mentioned earlier the GPU is situated in the base so you'll need it attached if you want to get the full amount of power. We're big fans of the Surface Pen, so we're happy to see that you'll be able to use it with the Surface Book. There's also support for the Surface Dock, which expands the amount of ports you get. Including dual 4K-capable DisplayPlay outputs, four USB 3.0 ports and Ethernet. The Surface Book is jam-packed with juicy tech, from the Windows Hello front-facing authentication camera that'll bypass your password screen to the support for 802.11ac MiMo wireless. There's also a rear-facing 8MP camera, two full-size USB 3.0 ports, an SD card reader and Mini Display Port. It's a looker too, with a magnesium body that weighs in at 726g (or 1579g with the keyboard attached).